Downstream bioprocessing steps have long been a challenge to drug manufacturers, particularly the chromatography step for purification of monoclonal antibodies (mAbs). The complexity of traditional chromatography options, as well as the high cost of the Protein A resin required, have driven the search for a more flexible, cost-effective, and convenient alternative. This article details how new multicolumn chromatography options present a unique and advantageous solution and reviews key items that should be taken into consideration when evaluating a multicolumn countercurrent technology. While the concept of multicolumn chromatography—also referred to as simulated moving bed (SMB) chromatography—is not new, it was not until recently that it began attracting serious interest from drug manufacturers. In application, multicolumn chromatography allows for product breakthrough in the load zone of the first column, with the second column capturing any breakthrough. Thus, a greater binding capacity for the first column is possible compared with batch chromatography, allowing for a reduction in the quantities of Protein A resin required, often by up to ~80%. This reduction in resin requirement is significant because Protein A resin is costly—in some cases it can even be a financial barrier for small and emerging pharmaceutical companies looking to get new drugs to the clinic. With industry attention shifting toward more flexible solutions, this approach presents the potential to dramatically lower the cost of mAb purification at both the process development and commercial scale. And because the technology uses several chromatography columns in parallel, it can be leveraged by manufacturers wishing to switch from batch to continuous processing, as multiple steps can be run simultaneously. Continuous chromatography enhances the overall column binding capacity by splitting the load zone into two columns in series. This allows loading for the first column in the series to a level above the dynamic binding capacity for a single column and closer to the static binding capacity for the resin. Ease of installation/operation: What is the system skid and function like? Protein A resin requirement/results: What amount of Protein A resin is required; what results are seen? Robustness and flexibility: Is the system capable of flexibility and robust, reproducible results? Durability of the hardware: What stands out about the functional design of the system? Functionality of the operating software: Is the software intuitive and supportive? Level of vendor support: Is the vendor heavily involved in process setup and augmentation if/as needed? Is support available around the clock? Scalability: Has the system been designed to scale from the lab to GMP commercial-scale production levels? After researching and assessing the systems on the market, the CMC Biologics process development team selected three for trials and on-site testing. After these trials, the CadenceTM BioSMB PD system from Pall Life Sciences was chosen for its ability to meet the criteria; a detailed review and key points about the system are outlined below. When evaluating any new technology, ease of installation and operation are critical considerations as they impact both the facility footprint and process flow. The system features a dramatically decreased footprint requirement from traditional systems. Additionally, it has been designed to streamline and optimize the purification process with an interchangeable format that allows for customization to each unique user processes, as well as minimizing many of the uncertainties associated with scale-up/scale-down, validation, and process control. Protein A capture chromatography is a crucial step in all downstream processing of mAbs. The process provides a highly effective and robust means of removing host cell proteins and other impurities from the harvested cell culture fluid (HCCF). scale-up of processes. However, Protein A resin is expensive, which means the costs associated with its use in chromatography can be very high. Due to the requirement from procurement, resin is often required in advance to produce clinical supply material at each phase of the development lifecycle. The cost burden associated with resin alone to get a new drug to the market can be substantial. The Cadence BioSMB PD system has been specifically designed to minimize Protein A resin use. For the purification of a 3 g/L mAb feed from a 2,000 L bioreactor a typical pre-packed Protein A column (1 × 56 L, 60 cm id × 20 cm) would be suitable and allows up to four cycles per 8-hour shift (300 cm/hr). In contrast, 4 × 4 L (20 cm id) pre-packed Protein A columns could be used with the PD system over the course of 11 cycles per batch; or by using 5–6 L total (10 cm id) pre-packed Protein A columns, the system could be used over the course of 33 cycles per batch. In additional experiments conducted by CMC Biologics, several analyses involved increasing the number of cycles and decreasing residence times to understand the robustness of the system and resin. In the experiments, our team could shorten residence times from the four to six minutes used in batch-mode chromatography systems, to between one and two minutes, with the ability to bind up to 40% more protein per liter of chromatography media than a comparable batch process. The system can accommodate up to 16 columns, with the number of columns used for any given process chosen based on the titer of the HCCF and the desired relative flow rate. The concept is based on selecting the optimum number of columns to purify a given process volume (or product mass), so the same system hardware can be used even with wide ranges in titer values. This ability to change the number of columns within the unit for a chromatographic process delivers the flexibility needed to match downstream flows. The Cadence BioSMB PD is the only system of its kind to have a disposable valve assembly. This eliminates the need for, and costs associated with, both cleaning and cleaning process validation. Additionally, a compact operational footprint enables decreased tank sizes, facility utility requirements, and water for injection (WFI) usage. The operating system software does not require a separate license, which affords users greater flexibility for writing methods and analyzing results on computers other than the laboratory unit. This also allows for multiple workstations to be employed and facilitates multisite information sharing. System support was critical in both evaluation and application phases. CMC Biologics can work directly with Pall Life Sciences experts to develop processes as well as to make appropriate changes to “personalize” the system for internal needs. In fact, having direct communication lines and onsite assistance with installation and initial operation of the system greatly facilitated the technology evaluation process. In October 2016, Pall launched the next-generation Cadence BioSMB Process system to complement the existing PD Scale System. This was another critical factor in the review and decision process, as ease of scaling from development to full-scale production is fundamental to the success of the technology. The system is a larger-scale, continuous-ready, cGMP-compliant chromatography system for manufacturing use, which has been designed to process up to 2,000 L HCCF within 6–8 hours using up to eight chromatography columns. It has been shown to scale up linearly from the process development system seamlessly. As in most cases, manufacturers can use the same chromatographic sorbent, buffer system, and product quality assays with the system that they employ in their current batch methods. 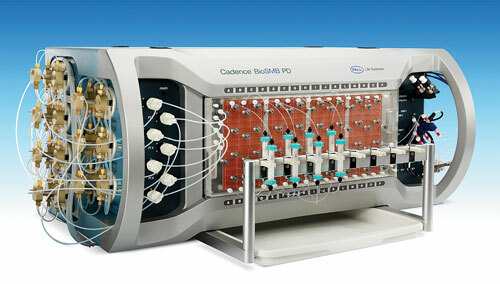 The same automated method used on the PD system can also be run on the at-scale Cadence BioSMB Process system, which is expected to streamline scale-up activities for new products. Pall’s Cadence BioSMB platform is a disposable flow path, continuous, multi-column chromatography solution, that allows users to convert an existing batch process into a continuous chromatography step without changing the chromatographic sorbent, buffer system, or product quality assays. Drug manufacturers of all types are tasked with finding solutions for today and for the future, especially as the industry continues to pivot toward smaller batches, higher titers, and more personalized medicines. New technologies like the Cadence BioSMB PD and Process systems have the potential to replace traditionally complex and risky process steps; while helping to reduce costs, and advance the march toward continuous bioprocessing. Michelle Najera, Ph.D. (mnajera@cmcbio.com), is downstream development scientist at CMC Biologics.